1. A grand total of two interchangeable mum outfits. Now, for some unbeknown reason when I was pregnant I seemed to think that once I had my baby I'd suddenly gain full use of the ridiculous amount of clothes in my wardrobe. Turns out, that's not the case. We may have had the baby but unfortunately we probably don't have the pre-baby body, so whilst we don't quite fill out our maternity clothes, we aren't yet into our old gear. So new mum fashion consists of a whole two baggy shirts and some leggings alternated daily. You can spot us a mile off. 2. Baby Talk (Don't worry, we hate us too). I already hate me for it. According to some big shot scientist, baby talk is actually bad for your childs mental development, it can slow it. Doesn't stop me from reaching octaves I never knew I could and calling my son 'chicken' at every opportunity. Baby talk doesn't stop at the baby unfortunately, it's new to us, we fall into it without even noticing. Chances are if you've spent any amount of time talking to a new mum she'll have put her 'mum' voice on without even noticing, just ignore it and whatever you do don't mimic the tone (we're not used to hearing baby talk..). 3. Yes, that's baby sick. There's been so much projectile baby spew in my life in the past four weeks that it's rare I manage to leave the house without at least a tiny bit of spit up in sight. I could change my jeans for the third time this morning, or I could wipe down with a damp cloth and hope that no one notices, or even if they do, they don't mention it. I'm a new mum after all, it's allowed, in fact, it's practically expected. Sure fire give away number 3, stained clothes, eyes peeled. 4. The frantic air of desperation whilst out in public. For me at least, the anxiety of going out my alone with my newborn is enough to send me into a bit of a tizzy - the minute the slightest of sounds comes from the pram I'm shooing and rocking the buggy in desperation, babies cry, I know that, but mums are supposed to be able to calm their kids, right? It's not happened yet, but the fear of not being able to calm Harrison during one of his crying fits is enough to drive me to not letting that pram stop moving even for a second. No new mum wants to look like they don't know what they are doing.. look for the girl franticly pushing the pram back and forth while cooing at the all but silent baby. New mum. Add to this the fact that although we've packed everything bar the kitchen sink in the three bags we have with us, we will have forgotten something, probably something important. 5. Two make up looks; non existent or one brush stroke away from drag queen. We either have no time at all (and don't really care enough) to put any make up whatsoever, or have that sparing five minutes while our babies nap to stick some slap on. Safe to say we'll be out of practice, and have a lot more to cover these days than we ever did before having kids, so too much concealer is definitely a thing. At least we tried. 6. At least three bags in tow (none of which contain the kitchen sink). I'll have a changing bag, filled to the brim with half of mothercare no doubt, a handbag if I'm trying to look put together and as though I have a hold on this whole motherhood thing, and chances are if I'm anywhere near a shopping centre I've got a bag filled with Next sleepsuits to exchange for the bigger size. 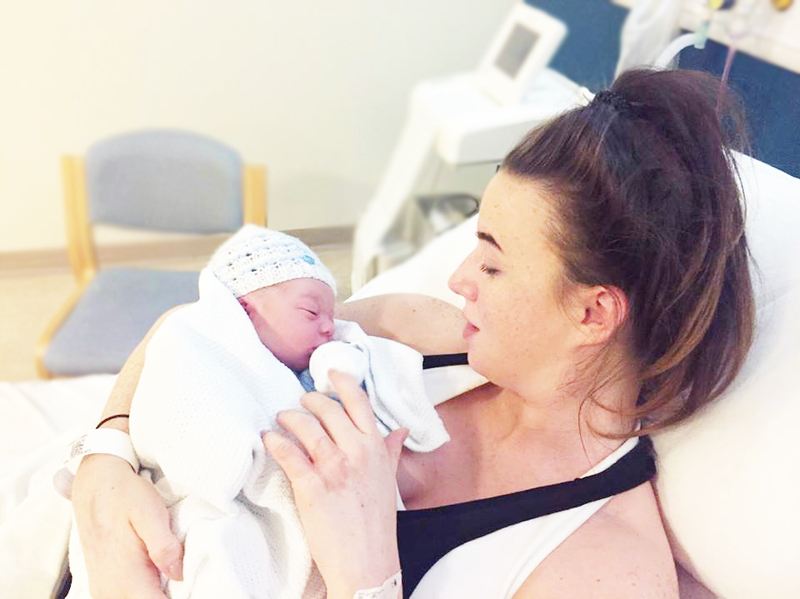 We managed to amass the entire Next range in newborn size when Harrison was born, but as we were so proud of how organised we now were, he obviously felt the need to knock us down a peg or two and grew out of them within the first week. It's been three weeks and we're still doing trips back and forth to Next (even I'm not brave enough to exchange 20 in one go...). But yes, long story short look for the bag lady, dead giveaway. 7. They won't be on time, in fact, chances are they won't even turn up. It takes at least 2 hours to leave the house with a newborn. By the time you get them ready, fed, somehow rested enough to allow yourself to get ready (ie out of jammies and maybe stuck a brush through your hair if your feeling glam), packed a bag and made numerous trips back and forth to the car, it's probably time to feed them again, and at this point going for coffee just doesn't seem worth it anymore. It's nothing short of a military operation to go on even the simplest outing with a newborn, timekeeping is barely possible. 8. Eyebags that are now glaringly close to the cheekbones. This doesn't even need clarification. Newborns don't often like to sleep at night-time, in case the dark shadows didn't make that obvious already. 9. Tiny human in tow.